Tom Rath, James K. Harter, Ph.D.
Much of what we think will improve our wellbeing is either misguided or just plain wrong. Contrary to what many people believe, wellbeing isn’t just about being happy. Nor is it only about being wealthy or successful. And it’s certainly not limited to physical health and wellness. In fact, focusing on any of these elements in isolation may drive us to frustration and even a sense of failure. Wellbeing: The Five Essential Elements will provide you with a holistic view of what contributes to your wellbeing over a lifetime. 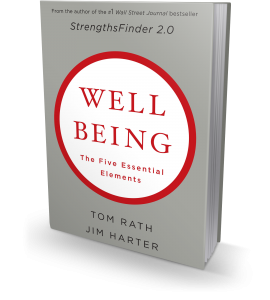 Written in a conversational style by #1 New York Times bestselling author Tom Rath and bestselling author Jim Harter, Ph.D., this book is filled with fascinating research and novel ideas for boosting your wellbeing in each of these five areas. Tom Rath has written three international bestsellers including How Full Is Your Bucket?, StrengthsFinder 2.0, and Strengths Based Leadership, which together sold more than 2 million copies in the U.S. alone. 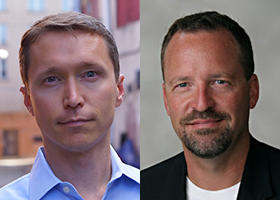 A 14-year veteran at Gallup, Rath currently leads Gallup’s workplace research and leadership consulting around the world. He lives with his wife and daughter in Washington, D.C.
James Harter, Ph.D., is Chief Scientist for Gallup’s international workplace management and wellbeing practices. He is co-author of the New York Times bestseller 12: The Elements of Great Managing and holds a doctorate in psychological and cultural studies at the University of Nebraska-Lincoln. Harter, his wife, and two sons live in Omaha.